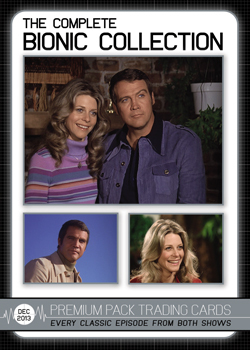 Boasting a deep autograph lineup, 2013 Rittenhouse The Complete Bionic Collection offers collectors a high-end product that honors The Six Million Dollar Man and The Bionic Woman franchises. 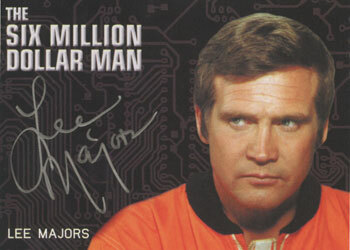 The 163-card base set will cover all episodes of The Six Million Dollar Man (103 cards), including the original movies and pilot. Also, each episode of The Bionic Woman will be honored (57 cards). Lastly, the base set will include cards for the three reunion specials. Autographs are the big feature in this product and each premium pack includes two on-card autographs. Either an Lindsey Wagner or Lee Majors autograph is guaranteed in each box. 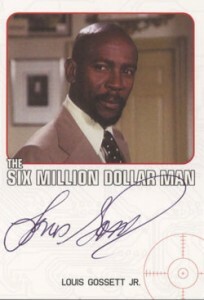 Other notable autographs include Louis Gossett, Jr., Erik Estrada, and Joan Van Ark. Each box includes a three-card Bionic Woman Implant set as a box topper. 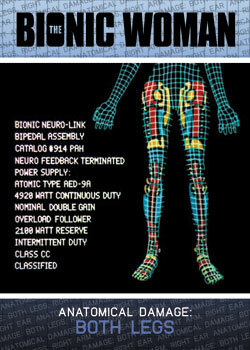 A Bionic Album is sold separately and is available to store the cards. 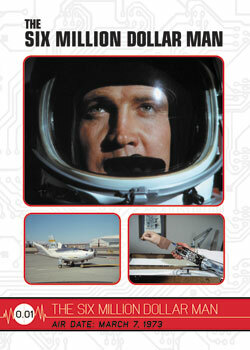 The custom-designed binder includes an exclusive promo card. Collectors busting multiple boxes of 2013 Rittenhouse The Complete Bionic Collection have several incentives available. The two-box incentive is a Richard Anderson (Oscar Goldman) Silver Signature Series Autograph and the four-box incentive is a Lee Majors Silver Series Autograph. Those planning to bust eight or more boxes will want to take advantage of the eight-box incentive. It features exclusive autographs, not found in packs, for William Shatner, Lindsay Wagner (Silver Signature Series), and Martin E. Brooks (Dr. Rudy Wells - variation). It also includes a complete master set of the base cards, all pack-inserted autographs, the box topper, and the two-box and four-box incentives. 163 cards. Shop for base cards on eBay. Inserted two per pack. Incentives and Archive Box exclusives noted.